After the block is carved, there are usually 4 prints made from that block. One is left black and white and called an artist's proof. The other 3 are mounted on a custom wooden panel (from recycled wood) and handpainted. The piece is then varnished for preservation. All works are originals but are part of a 3 print series. 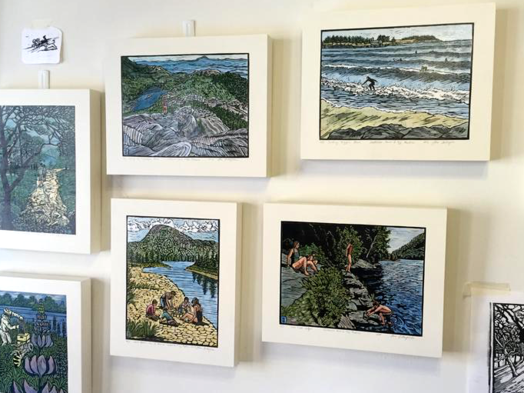 For Reduction woodblock prints, there are 5-7 prints made in a series. All the colors are from repeated inkings and being run through the press. They are also individually framed as above. 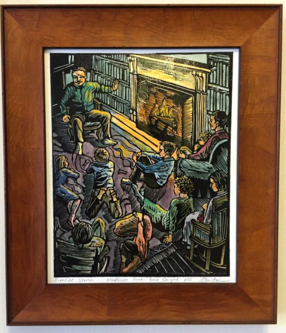 The cost of original framed prints generally ranges between $250-$650. Please e-mail Blue at blue.butterfield@gmail.com if you would like a to arrange a time to view her studio in downtown Portland. 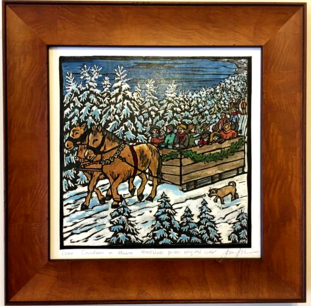 Original prints from Christmas in Maine are also available, framed in beautiful hardwood to match the historic period.